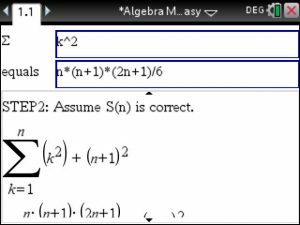 Here is how to do Proof by Induction using the TiNspire CX CAS calculator – step by step. 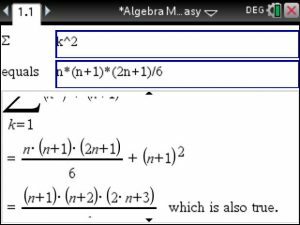 You first launch Algebra Made Easy and select Proof by Induction for Sums in the menu. 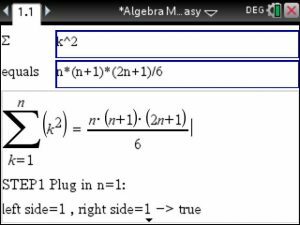 In Step1 (the base case) we plug in 1 into both sides of the equation. 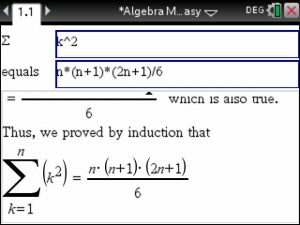 If we get a matching answer we move on to Step 2.
then proof by induction allowed is to verify the given identity. Voila! !